Each video is approximately twelve minutes in length, and evaluates an energy issue relevant to Alberta. The resource provides science background on the topic being explored, then highlights students’ research as they investigate the question from various viewpoints. Following an overview of how wind energy is captured to create electricity, students highlight the opportunities and challenges related to developing wind power in Alberta. This video follows a group of friends though the Woodland Caribou, Grizzly Bear and bird habitats of the Calgary Zoo, as they examine the effects of Alberta’s energy development on these important animal species. After a visual description of the science and technology of hydraulic fracturing, students present their research on four key stakeholder perspectives – government, industry, landowner and environmental. 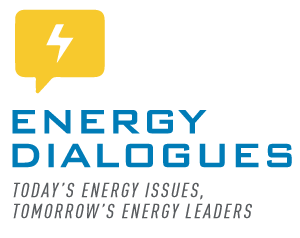 After watching videos from the Energy Dialogues series, students can further their learning by responding to the guiding questions. They can be completed by students independently or can be used to stimulate class discussion. The activities below challenge students to delve further into the science and stakeholder viewpoints. In this way, students are encouraged to start developing their own unique opinion while considering the multiple perspectives. Each issues-based activity can accompany any of the videos in the series. After watching the video and discovering the science behind the energy question, have students summarize their learning. Encourage them to use their creativity to communicate concepts through a presentation, comic strip, dramatization, animation, photo album, etc. After watching the video, place signs representing each of the perspectives (for example: Environment, Farming, Government, Industry -OR- Opportunities & Challenges) in the corners of the classroom. Have students move to the corner (perspective) that is supported by their statement. Encourage them to compare their ideas within their groups. How many of the statements are the same? Are any of them unique? As a class, make observations based on the disbursement of students around the room. Which perspectives seem the strongest? Weakest? Why? Ask individual students to share their statement and support their choice. Create a continuum along the classroom with one end representing strongly agree and the other representing strongly disagree. Read out a statement and ask students to place themselves along the continuum. If appropriate, discuss why they chose that location. This activity could also be done by assigning each student a stakeholder perspective (i.e., landowner or industry representative). Have students think about how that stakeholder might respond to the statement and align themselves on the continuum. Brainstorm a list of issues that are related to the topic being discussed. Write five or more issues on separate pieces of flip chart paper. Distribute 10 stickers to each student (ideal if stickers are identical to ensure anonymity). Ask students to consider how important each issue is to them. (for example: if they were managing the resource which issues/topics would they make a priority). Have them assign their stickers to the issues based on which topics matter the most to them. They do not have to distribute stickers equally. After all students have placed their stickers, discuss the distribution. Are there some topics that the class feels very strongly about? Why?